What timeout value has expired when the optimizer times out? Can it be set? How long is it? The optimizer itself decides on what it thinks will be an acceptible length of time to attempt to optimize a query. It’s based on the cost estimates it arrives at after the first pass throught the query. I know very few of the details as to how this works. You can’t set it and the length of time varies, so there’s not a hard number I can provide. Great post, Grant! Few people realize, but IMHO, this is the primary reason that splitting a subquery off into a #temp table is a big win so often: not because temp tables are inhrently better than subqueries, but because it has the side-effect of splitting one big query into two smaller queries, giving the optimizer a much better chance of finding a good plan for each of them. You don’t need me to validate you, but you’re 100% correct. While the optimizer is an absolutely amazing bit of code, it’s not infallible. Most of the time, it will do the work for you, but occasionally, you have to pitch in and try to help it out, restructuring, rewriting, etc. Thanks for bringing that up. Well done! Helpful little tidbit of information! If the optimiser was allowed to examine plans until it found the best plan for a particular query, the optimisation of a moderately complex query could easily run for days. They should use a low-priority process in the background to further optimize plants according to prioritization. Without adding MAGIC, a better job can be done…period! It should also discover this way the level of parameterization that is requered. If on a 2nd or 3rd run the execution engine detects that what at first is considered a variable is in fact not or just only weakly modifying like status = 0 or status = 1. Appropiate plans should be deviced for later resuse in spare cpu time. This can easily overlap with IO operations and thus never affect perfomance in a negative way. 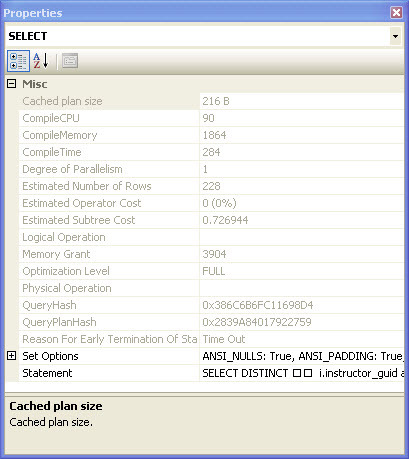 The executon engine can check for discovered predicates and pick the optimized plan based on the “variable” input. Considering everything the optimizer does, I suspect this might be difficult, but it reall does make sense. You’re probably on the track that the guys writing the engine are. As CPU power increases, the ability to more in less time should open up just the types of things you’re proposing. While it sounds easy, in general (and I’m talking general planning, not specific to the SQL optimiser), modifying an existing plan is harder (more complex, more resource intensive) than scrapping the plan and starting from scratch. There’s a very nice academic paper around on that that does a formal proof of that. What might be possible is for a background process to work through the cached plans looking for ones that are no longer optimal (though how to tell that a plan is not optimal is another difficult problem) and mark those for recompile. Could help out in cases of parameter sniffing or when the optimiser wasn’t able to do a good enough job the first time or in other odd cases where there is no single optimal plan. It’s a trade off. Each version the optimiser’s getting more complex, more resource intensive, so you want to cache plans more so as not to incur that overhead more often than necessary. On the flip side, cache too much and the queries don’t get good plans. It’s another area of research. Use Google Scholar and search for ‘overfitting’ if you’re interested. The idea is not to start over with the plan or modify it, but conserve the state that left on the first pass when the normal process was stopped prematurely by the determined timeout. A conservative implementation thus only keeps memory resources around for problem cases when no good enaugh plan was found on the initial pass. Resources that are freed as soon as a good enaugh plan is found and replaces the old ‘optimization incomplete’ plan. Great post Grant…I enjoy reading your posts very much. There is always something new I learn reading your articles/posts.